This was another of our heathy weeknight ideas – some of which turn out surprisingly well and others that turn out a bit bland and boring (we don’t blog the bland ones). This was great, though beware of wasabi fumes coming down your nose, a sensation we quite like but mightn’t be for everyone. The cucumber salad was a real hit too – salty, sweet, hot and sour. Felt like a bit of a treat in fact. Rub the salmon all over with a tiny bit of oil and then the wasabi paste. Split the cucumber in half lengthways and discard the seeds. Cut into large diagonal chunks and put in a bowl. Add the chilli, rice vinegar, salt, sugar, poppyseeds and a bit of pepper. Mix well until the salt and sugar have dissolved. There will be quite a lot of liquid but don’t worry and don’t be tempted to leave out the salt as it is essential for the hot, sour, salty, sweet balance. Preheat your grill and grill the fish for 5-6 minutes or until is turned a nice colour on top and is just cooked through (no need to turn it over). 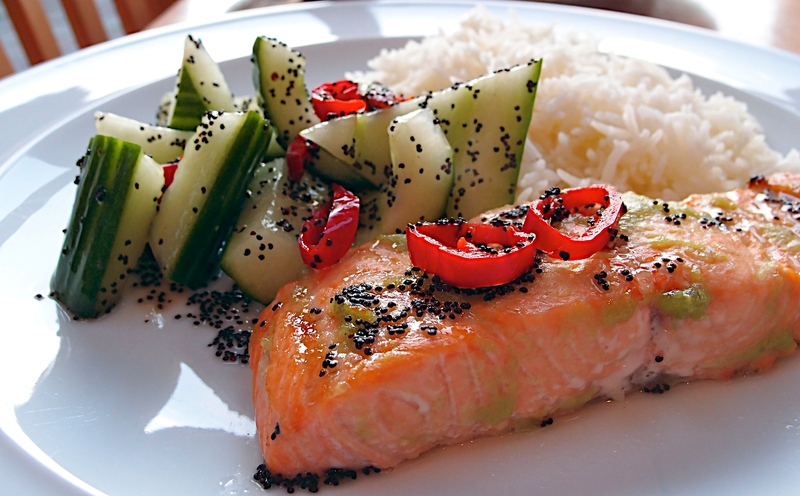 Serve with the cucumber salad and steamed rice. The salad dressing is nice drizzled over the fish too. This was also great…very refreshing!